David Glen Eisley (born September 5, 1952) is an American rock singer, songwriter, and actor. Eisley was born in Los Angeles, California, and is the son of actor Anthony Eisley and Judith Tubbs Eisley. While in high school, he played drums for the band Mammoth, an Iron Butterfly cover band. Before settling into music, Eisley spent much of his early days playing baseball. He eventually reached Double-A for the San Francisco Giants, commuting back and forth between games and club gigs. He is married to actress Olivia Hussey with whom he has one daughter, India Eisley. He is the older brother of Jonathan Erickson Eisley. 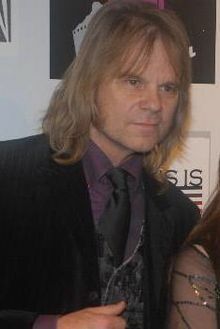 He is most well known for being the lead singer for the AOR bands Sorcery (1980–1983), Giuffria (1983–1988), Dirty White Boy (1988–1991), and Stream (1998). His biggest success came with the band Giuffria, when their hit single "Call to the Heart" reached number 15 on the Billboard Hot 100 in early 1985. Eisley has also appeared in the television shows Beverly Hills, 90210 and 7th Heaven, the movie Action Jackson and has acted in various commercials. Eisley's rock ballad "Sweet Victory," which was co-created by Bob Kulick and includes Eric Singer on drums, was featured in the 2001 SpongeBob SquarePants episode "Band Geeks" and reached number 23 on the Hot Rock Songs chart in February 2019. He has released three solo albums, War Dogs in 1999, Stranger from the Past in 2000, and a compilation album of previously unreleased songs, The Lost Tapes, in 2003. In 2017, Eisley was featured as lead vocalist on three songs on Bob Kulick's album, Skeletons in the Closet. On December 1, 2017 he released an album with Craig Goldy, under the band name Eisley/Goldy, titled Blood, Guts And Games. ^ "Giuffria - Chart history | Billboard". www.billboard.com. Retrieved 28 June 2016. ^ "Hot Rock Songs". Billboard. Retrieved 12 February 2019. ^ Maron, John; Brady, Bradford (22 October 2015). "ON THE RECORD: What '80s rock ballad was SpongeBob jamming out to?". Retrieved 28 June 2016. ^ Buczek, Ben (25 September 2015). "Why 'Sweet Victory' is the greatest song of all time". Retrieved 28 June 2016. ^ "BOB KULICK Unleashes His 'Skeletons In The Closet'". MelodicRock.com. 2017-09-15. Retrieved 2018-01-04. ^ October 17, 2017 (2017-10-17). "David Glen Eisley And Craig Goldy To Release Eisley/Goldy Debut". Blabbermouth.net. Retrieved 2018-01-04.